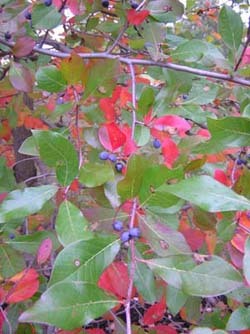 Black Gum Tree (Nyssa sylvatica) fall color and fruit. White Oak Nursery has been propagating and growing over 80 species of native shade trees and native flowering shrubs since 1995. W.O.N. grows the majority of woody species that are native to the northeastern United States plus the best ornamental trees from around the world. This choice of species allows you to design complete landscapes entirely with native plants but also to establish complete plant communities that benefit native wildlife. Plants in our landscapes should serve a dual purpose. Plants should not only delight and beautify our lives and yards but they should also serve their age-old function of providing food and shelter for native wildlife. Only native flora can provide the essential ingredients that native wildlife needs to survive. White Oak's mission is to introduce you to the full range of landscape and ecological possibilities by using native plants and make them assessable to you and the nursery/landscape industry. This website provides important educational information on how to integrate native plants into our landscapes and at the same time provide the best habitat for native wildlife. It's a win/win combination.